"Deferent" redirects here. For the acknowledgement of the legitimacy of the power of one's superior or superiors, see Deference. In the Hipparchian and Ptolemaic systems of astronomy, the epicycle (from Ancient Greek: ἐπίκυκλος, literally on the circle, meaning circle moving on another circle) was a geometric model used to explain the variations in speed and direction of the apparent motion of the Moon, Sun, and planets. In particular it explained the apparent retrograde motion of the five planets known at the time. Secondarily, it also explained changes in the apparent distances of the planets from Earth. It was first proposed by Apollonius of Perga at the end of the 3rd century BC. It was developed by Apollonius of Perga and Hipparchus of Rhodes, who used it extensively, during the second century BC, then formalized and extensively used by Ptolemy of Thebaid in his 2nd-century AD astronomical treatise the Almagest. Epicyclical motion is used in the Antikythera mechanism, an ancient Greek astronomical device for compensating for the elliptical orbit of the Moon, moving faster at perigee and slower at apogee than circular orbits would, using four gears, two of them engaged in an eccentric way that quite closely approximates Kepler's second law. The basic elements of Ptolemaic astronomy, showing a planet on an epicycle (smaller dashed circle), a deferent (larger dashed circle), the eccentric (X) and an equant (larger black dot). In both Hipparchian and Ptolemaic systems, the planets are assumed to move in a small circle called an epicycle, which in turn moves along a larger circle called a deferent. Both circles rotate clockwise and are roughly parallel to the plane of the Sun's orbit (ecliptic). Despite the fact that the system is considered geocentric, each planet's motion was not centered on the Earth but at a point slightly away from Earth called the eccentric. The orbits of planets in this system are similar to epitrochoids. In the Hipparchian system the epicycle rotated and revolved along the deferent with uniform motion. However, Ptolemy found that he could not reconcile that with the Babylonian observational data available to him; in particular, the shape and size of the apparent retrogrades differed. The angular rate at which the epicycle traveled was not constant unless he measured it from another point which he called the equant. It was the angular rate at which the deferent moved around the point midway between the equant and the Earth (the eccentric) that was constant; the epicycle center swept out equal angles over equal times only when viewed from the equant. It was the use of equants to decouple uniform motion from the center of the circular deferents that distinguished the Ptolemaic system. Had his values for deferent radii relative to the Earth-Sun distance been more accurate, the epicycle sizes would have all approached the Earth-Sun distance. Although all the planets are considered separately, in one peculiar way they were all linked: the lines drawn from the body through the epicentric center of all the planets were all parallel, along with the line drawn from the sun to the Earth along which Mercury and Venus were situated. 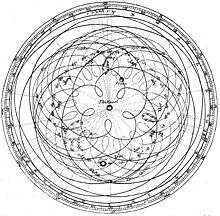 That means that all the bodies revolve in their epicycles in lock step with Ptolemy's sun (that is, they all have exactly a one year period). Babylonian observations showed that for superior planets the planet would typically move through in the night sky slower than the stars. Each night the planet appeared to lag a little behind the stars, in what is called prograde motion. Near opposition, the planet would appear to reverse and move through the night sky faster than the stars for a time in retrograde motion before reversing again and resuming prograde. Epicyclic theory, in part, sought to explain this behavior. The inferior planets were always observed to be near the sun, appearing only shortly before sunrise or shortly after sunset. Their apparent retrograde motion occurs during the transition between evening star into morning star, as they pass between Earth and the sun. When ancient astronomers viewed the sky, they saw the Sun, Moon, and stars moving overhead in a regular fashion. They also saw the "wanderers" or "planetai" (our planets). The regularity in the motions of the wandering bodies suggested that their positions might be predictable. The most obvious approach to the problem of predicting the motions of the heavenly bodies was simply to map their positions against the star field and then to fit mathematical functions to the changing positions. The ancients worked from a geocentric perspective for the simple reason that the Earth was where they stood and observed the sky, and it is the sky which appears to move while the ground seems still and steady underfoot. Some Greek astronomers (e.g., Aristarchus of Samos) speculated that the planets (Earth included) orbited the Sun, but the optics (and the specific mathematics – Newton's Law of Gravitation for example) necessary to provide data that would convincingly support the heliocentric model did not exist in Ptolemy's time and would not come around for over fifteen hundred years after his time. Furthermore, Aristotelian Physics was not designed with these sorts of calculations in mind, and Aristotle's philosophy regarding the heavens was entirely at odds with the concept of heliocentrism. It was not until Galileo Galilei observed the moons of Jupiter on January 7, 1610, and the phases of Venus in September 1610 that the heliocentric model began to receive broad support among astronomers, who also came to accept the notion that the planets are individual worlds orbiting the Sun (that is, that Earth is a planet and is one among several). Johannes Kepler was able to formulate his three laws of planetary motion, which described the orbits of the planets in our solar system to a remarkable degree of accuracy; Kepler's three laws are still taught today in university physics and astronomy classes, and the wording of these laws has not changed since Kepler first formulated them four hundred years ago. The apparent motion of the heavenly bodies with respect to time is cyclical in nature. Apollonius of Perga realized that this cyclical variation could be represented visually by small circular orbits, or epicycles, revolving on larger circular orbits, or deferents. Hipparchus calculated the required orbits. Deferents and epicycles in the ancient models did not represent orbits in the modern sense. Claudius Ptolemy refined the deferent/epicycle concept and introduced the equant as a mechanism for accounting for velocity variations in the motions of the planets. The empirical methodology he developed proved to be extraordinarily accurate for its day and was still in use at the time of Copernicus and Kepler. Owen Gingerich describes a planetary conjunction that occurred in 1504 that was apparently observed by Copernicus. In notes bound with his copy of the Alfonsine Tables, Copernicus commented that "Mars surpasses the numbers by more than two degrees. Saturn is surpassed by the numbers by one and a half degrees." Using modern computer programs, Gingerich discovered that, at the time of the conjunction, Saturn indeed lagged behind the tables by a degree and a half and Mars led the predictions by nearly two degrees. Moreover, he found that Ptolemy's predictions for Jupiter at the same time were quite accurate. Copernicus and his contemporaries were therefore using Ptolemy's methods and finding them trustworthy well over a thousand years after Ptolemy's original work was published. When Copernicus transformed Earth-based observations to heliocentric coordinates, he was confronted with an entirely new problem. The Sun-centered positions displayed a cyclical motion with respect to time but without retrograde loops in the case of the outer planets. In principle, the heliocentric motion was simpler but with new subtleties due to the yet-to-be-discovered elliptical shape of the orbits. Another complication was caused by a problem that Copernicus never solved: correctly accounting for the motion of the Earth in the coordinate transformation. In keeping with past practice, Copernicus used the deferent/epicycle model in his theory but his epicycles were small and were called "epicyclets". In the Ptolemaic system the models for each of the planets were different and so it was with Copernicus' initial models. As he worked through the mathematics, however, Copernicus discovered that his models could be combined in a unified system. Furthermore, if they were scaled so that Earth's orbit was the same in all of them, the ordering of the planets we recognize today easily followed from the math. Mercury orbited closest to the Sun and the rest of the planets fell into place in order outward, arranged in distance by their periods of revolution. Although Copernicus' models reduced the magnitude of the epicycles considerably, whether they were simpler than Ptolemy's is moot. Copernicus eliminated Ptolemy's somewhat-maligned equant but at a cost of additional epicycles. Various 16th-century books based on Ptolemy and Copernicus use about equal numbers of epicycles. The idea that Copernicus used only 34 circles in his system comes from his own statement in a preliminary unpublished sketch called the Commentariolus. By the time he published De revolutionibus orbium coelestium, he had added more circles. Counting the total number is difficult, but estimates are that he created a system just as complicated, or even more so. Koestler, in his history of man's vision of the universe, equates the number of epicycles used by Copernicus at 48. The popular total of about 80 circles for the Ptolemaic system seems to have appeared in 1898. It may have been inspired by the non-Ptolemaic system of Girolamo Fracastoro, who used either 77 or 79 orbs in his system inspired by Eudoxus of Cnidus. Copernicus in his works exaggerated the number of epicycles used in the Ptolemic system; although original counts ranged to 80 circles, by Copernicus's time the Ptolemic system had been updated by Peurbach towards the similar number of 40; hence Copernicus effectively replaced the problem of retrograde with further epicycles. Copernicus' theory was at least as accurate as Ptolemy's but never achieved the stature and recognition of Ptolemy's theory. What was needed was Kepler's elliptical theory, not published until 1609. Copernicus' work provided explanations for phenomena like retrograde motion, but really didn't prove that the planets actually orbited the Sun. The deferent (O) is offset from the earth (T). P is the centre of the epicycle of the sun S.
Ptolemy's and Copernicus' theories proved the durability and adaptability of the deferent/epicycle device for representing planetary motion. The deferent/epicycle models worked as well as they did because of the extraordinary orbital stability of the solar system. Either theory could be used today and might still be in use had Isaac Newton not invented Physics and the Calculus. The first planetary model without any epicycles was that of Ibn Bajjah (Avempace) in 12th century Andalusian Spain, but epicycles were not eliminated in Europe until the 17th century, when Johannes Kepler's model of elliptical orbits gradually replaced Copernicus' model based on perfect circles. Newtonian or Classical Mechanics eliminated the need for deferent/epicycle methods altogether and produced more accurate theories. By treating the Sun and planets as point masses and using Newton's law of universal gravitation, equations of motion were derived that could be solved by various means to compute predictions of planetary orbital velocities and positions. Simple two-body problems, for example, can be solved analytically. More-complex n-body problems require numerical methods for solution. The power of Newtonian mechanics to solve problems in orbital mechanics is illustrated by the discovery of Neptune. Analysis of observed perturbations in the orbit of Uranus produced estimates of the suspected planet's position within a degree of where it was found. This could not have been accomplished with deferent/epicycle methods. Still, Newton in 1702 published Theory of the Moon's Motion which employed an epicycle and remained in use in China into the nineteenth century. Subsequent tables based on Newton's Theory could have approached arcminute accuracy. According to one school of thought in the history of astronomy, minor imperfections in the original Ptolemaic system were discovered through observations accumulated over time. It was mistakenly believed that more levels of epicycles (circles within circles) were added to the models to match more accurately the observed planetary motions. The multiplication of epicycles is believed to have led to a nearly unworkable system by the 16th century, and that Copernicus created his heliocentric system in order to simplify the Ptolemaic astronomy of his day, thus succeeding in drastically reducing the number of circles. As it turns out, a major difficulty with this epicycles-on-epicycles theory is that historians examining books on Ptolemaic astronomy from the Middle Ages and the Renaissance have found absolutely no trace of multiple epicycles being used for each planet. The Alfonsine Tables, for instance, were apparently computed using Ptolemy's original unadorned methods. Another problem is that the models themselves discouraged tinkering. In a deferent/epicycle model, the parts of the whole are interrelated. A change in a parameter to improve the fit in one place would throw off the fit somewhere else. Ptolemy's model is probably optimal in this regard. On the whole it gave good results but missed a little here and there. Experienced astronomers would have recognized these shortcomings and allowed for them. "Whereas we use 'hypothesis' to denote a tentative theory which is still to be verified, Ptolemy usually means by ύπόθεσις something more like 'model', 'system of explanation', often indeed referring to 'the hypotheses which we have demonstrated'." Copernicus added an extra epicycle to his planets, but that was only in an effort to eliminate Ptolemy's equant, which he considered a philosophical break away from Aristotle's perfection of the heavens. Mathematically, the second epicycle and the equant produce the same results, and many Copernican astronomers before Kepler continued using the equant, as the math was easier. There is no bilaterally-symmetrical, nor excentrically-periodic curve used in any branch of astrophysics or observational astronomy which could not be smoothly plotted as the resultant motion of a point turning within a constellation of epicycles, finite in number, revolving around a fixed deferent. Any path—periodic or not, closed or open—can be represented with an infinite number of epicycles. This is because epicycles can be represented as a complex Fourier series; so, with a large number of epicycles, very complicated paths can be represented in the complex plane. which is periodic just when every pair of 's is rationally related. Finding the coefficients to represent a time-dependent path in the complex plane, , is the goal of reproducing an orbit with deferent and epicycles, and this is a way of "saving the phenomena" (σώζειν τα φαινόμενα). ↑ "epicycle". Online Etymology Dictionary. ↑ Andrea, Murschel (1995). "The Structure and Function of Ptolemy's Physical Hypotheses of Planetary Motion". Journal for the History of Astronomy (xxvii): 33–61. Bibcode:1995JHA....26...33M. Retrieved 2 August 2014. ↑ One volume of de Revolutionibus was devoted to a description of the trigonometry used to make the transformation between geocentric and heliocentric coordinates. ↑ Palter, Robert (1970). "Approach to the History of Astronomy". Studies in the History and Philosophy of Science. 1: 94. ↑ Owen Gingerich, Alfonso X as a Patron of Astronomy, in The Eye of Heaven: Ptolemy, Copernicus, Kepler (New York: American Institute of Physics, 1993), p. 125. ↑ Gingerich, Crisis versus Aesthetic in the Copernican Revolution, in Eye of Heaven, pp. 193–204. ↑ "The popular belief that Copernicus's heliocentric system constitutes a significant simplification of the Ptolemaic system is obviously wrong ... .[T]he Copernican models themselves require about twice as many circles as the Ptolemaic models and are far less elegant and adaptable. ", Neugebauer, Otto (1969) . The Exact Sciences in Antiquity (2 ed.). Dover Publications. ISBN 978-0-486-22332-2. , p. 204. This is an extreme estimate in favor of Ptolemy. ↑ Palter, Approach to the History of Astronomy, pp. 113–14. ↑ Goldstein, Bernard R. (1972). "Theory and Observation in Medieval Astronomy". Isis. 63 (1): 39–47 [40–41]. doi:10.1086/350839. ↑ Kollerstrom, Nicholas (2000). Newton's Forgotten Lunar Theory. Green Lion Press. ISBN 1-888009-08-X. ↑ Dorothy Stimson, The Gradual Acceptance of the Copernican Theory of the Universe. (New York, 1917), p. 14.. The quotation is from John Milton's Paradise Lost, Book 8, 11.82–85. ↑ Encyclopaedia Britannica, 1968, vol. 2, p. 645. This is identified as the highest number in Owen Gingerich, Alfonso X. Gingerich also expressed doubt about the quotation attributed to Alfonso. In The Book Nobody Read (p. 56), however, Gingerich relates that he challenged Encyclopaedia Britannica about the number of epicycles. Their response was that the original author of the entry had died and its source couldn't be verified. ↑ Toomer, G.J. (1998). Ptolemy's Almagest. Princeton University Press. p. 23. ISBN 0-691-00260-6. ↑ Hanson, Norwood Russell (1960-06-01). "The Mathematical Power of Epicyclical Astronomy" (PDF). Isis. 51 (2): 150–158. doi:10.1086/348869. ISSN 0021-1753. JSTOR 226846. Retrieved 2011-10-21. ↑ See, e.g., this animation made by Christián Carman and Ramiro Serra, which uses 1000 epicycles to retrace the cartoon character Homer Simpson; cf. also Christián Carman's "Deferentes, epiciclos y adaptaciones." and "La refutabilidad del Sistema de Epiciclos y Deferentes de Ptolomeo." ↑ Lucio Russo: The forgotten revolution. How science was born in 300 BC and why it had to be reborn. Springer, Berlin. 2004, ISBN 3-540-20068-1, p. 91. Wikimedia Commons has media related to Epicycle. An excellent presentation on Ptolemy, Copernicus, Brahe and Kepler, based on Kepler's writings. Part 1 examines the different systems and their equivalence, Parts 2 and onwards examine Kepler's derivation of his laws.